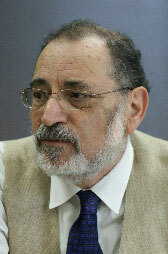 Prof. emeritus of Economics at Ben Gurion University and Israeli coordinator of the Aix Group. Arie Arnon was over the years a visiting scholar and teacher in Berkley, CA; Penn, PA; the New School, NY; SOAS, London and other institutions He was the founder and former head of the “Program on Economics and Society” at Van Leer Institute, Jerusalem, and has been the coordinator of the Israeli team of the Aix Group since 2002. His areas of research include macroeconomics, monetary theory, the Israeli labor market, and the history of economic thought, with a major focus in recent years on the political economy of the Israeli-Palestinian conflict. Dr. Arnon has been a Visiting Faculty and Visiting Scholar at Stanford University, the University of California Berkeley, SOAS (London) and the University of Pennsylvania. He has worked as a Senior Economist in the research department of the Bank of Israel and as a consultant to the World Bank. In the mid-1990s he was a member of the Committee on Economic Affairs Concerning the Negotiations with the Palestinians [Ben-Shahar Committee 1993]; a member of the Economic “Separation” Committee [Brodet Committee 1995]; and a member of the “Harvard Project on Palestinian Refugees”, Kennedy School of Government, Institute for Social and Economic Policy in the Middle East, Harvard University . Since 2002 Professor Arnon has been the coordinator of the Israeli team of the Aix Group.